Robust and highly efficient collector mower for larger sized gardens. 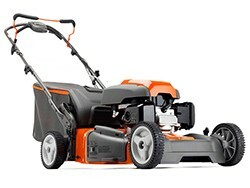 Built on a durable, welded steel cutting deck and provided with a strong and easy-start OHC-engine. Easy and comfortable to manoeuvre thanks to the innovative AutoWalk™ 2 drive system. The LC 356-series offers three cutting methods to choose between. Lagan za pokretanje, snažan Honda motor.